Concept Art from Disney's INTO THE WOODS + Save 50% on the Blu-Ray! Concept Art from Disney’s INTO THE WOODS + Save 50% on the Blu-Ray! It seems like Disney announced it's production of Into the Woods so long ago, but I really couldn't wait for the Blu-Ray release! The truth is, I can consume every fact, story and bit of trivia from so many musicals. The fact that Into the Woods is a Disney-made Sondheim musical means that I couldn't wait to get my hands on my own copy to take in all the extras on the Into the Woods Blu-Ray and digital HD! From the director of “Chicago” and the producer of “Wicked” comes a modern twist on the beloved fairy tales you thought you knew. Academy Award®-Winning actress Meryl Streep (Best Actress, The Iron Lady), leads an all-star cast in this enchanted adventure about daring to venture Into The Woods. With an all-star cast, this spellbinding adventure is everything you could ever wish for! Producers: Marc Platt (Wicked), Rob Marshall (Academy Award®-winning musical Chicago), John DeLuca (Nine) and Callum McDougall (Wicked). 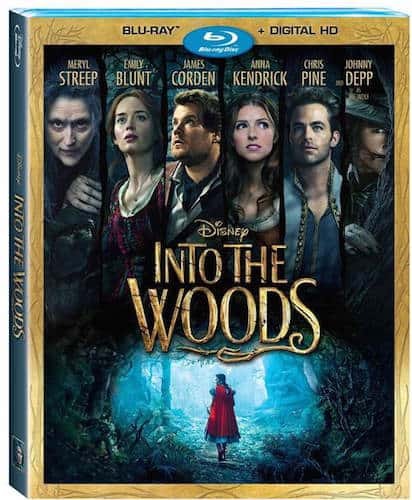 Into the Woods is newly available on Blu-Ray & Digital HD, and right now, you can save 50% on the list price! Regularly priced at $40, you can get Into the Woods for just $19.98, and it's even eligible for free shipping! She counts among her many other film credits J.J. Abrams’ blockbuster “Mission: Impossible III,” Andrew Niccol’s “In Time” and “Gattacca,” Tom Hanks’ “That Thing You Do!,” Lawrence Kasdan’s “Mumford” and “Wyatt Earp,” Michael Mann’s “Manhunter” and Michael Apted’s “Firstborn,” which marked her first film as a costume designer. In November, 2014, Atwood debuted an exclusive line of luxury handbags. Disclosure: Disney and/or the associated PR firm provided me with the product to facilitate the review. I love seeing this concept art. I always find it interesting to see what the ideas were that lead to the actual characters or costumes in a movie. I totally missed this when it was in the theater, so now is my chance to see it. I can’t wait. This sounds like a very interesting story. I love modern takes on fairytales and the cast seems amazing. The concept art also seems quite cool. I absolutely love Anna Kendrick! It must be amazing to be a set designer or a costume maker. Sewing (and the computer rendering/concept before) is such a skilled art and dressing some of these celebrities would make it an even better job! I love Anna Kendrick…and I am so excited to see this movie! There are a ton of great actors in it! I love the concept art. It’s interesting to look at people’s own interpretation about the movie. My kids has been waiting for this movie to be shown at our local movie theater. We always have late showing here so it’s a bummer. Would love to see this movie. I didn’t get a chance to see in the theaters but it looks great. We haven’t seen this movie yet but we belong to the Disney Movie Club and I think this is this months pick so we may get it. I have yet to see this but I know my girls want to see it! I’m not so sure it’s age appropriate for them but eventually I’d like to watch it as well, looks great! ummmm I’m kinda in shock right now because I’m disney obsessed and yet have not heard of this film!!! I’m going to have to check this out! Ooh, I can’t wait to see this movie! I’ve been wanting to see it for some time now! I finally got to see this movie. Kiddo, her dad and myself had family movie night. It was aahhmazing. There was a LOT of signing. I knew had some, but I didn’t realize how much. But, it was still really good. I was in exactly the same boat, Cara! You really need to watch this movie! I missed this at the movie theater as well. SO glad it’s on DVD! I love the costumes of the characters in Into The Woods! I’d love a Blueray copy. This movie is on my list of films to see. I like the mixture of characters and actresses in it. Fairy tale-inspired movies are one of my favorites. I still haven’t seen this yet but it looks so awesome! There are so many great actors in this and I can’t wait to see it with my son! I could not wait for this to come out on DVD! I love Anna Kendrick and her voice is amazing. Love this post!